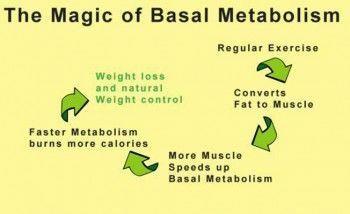 BMR is short for Basal Metabolic Rate. It is the measure of minimum amount of energy that our body needs even when it is at total rest for functions such as- maintaining basic cell function and normal body temperature. BMR accounts for approximately two third of the body total energy expenditure under normal daily exertion. This is distributed majorly among the following. BMR is inconsistent and it constantly changes with the person’s age, height, weight and lean body mass (total weight minus weight of adipose/fat tissues). At normal body mass index, lean mass accounts for around 80 % of the total body weight in men and 75 % in women. If you are an athletic person and you gain weight, the basal metabolic rate increases by approximately 3 kilocalories (kcal) per kilogram (kg) of lean body mass per day. However, if the weight gain only involves enlarging the fatty skin layer, the basal metabolic rate will hardly change. This is the reason why people who are physically inactive experience only minor weight losses by diet alone. As one’s age increases, the metabolic processes slow down which leads to weaker muscular strength. This is the reason why the elderly have a lower basal metabolic rate than young people. Men have approximately 10 % larger muscle mass as compared to women. • During sleep, BMR drops by 7–10 % for an average person while during longer periods of fasting it could drop by 20–40 %. • Stress, sweating, fever and living in regions with low temperatures are the factors that elevate BMR while depression and acclimation to tropical temperatures lower it. • The variables impacting the basal metabolic rate are primarily controlled by the thyroid hormones. They crank up oxygen consumption and cause an increase in thermogenesis.